When this card is activated: Look at the top 3 cards of your Deck, then you can reveal 1 "Dark Magician" or 1 Spell/Trap that specifically lists the card "Dark Magician" in its text, among them, and add it to your hand, also place the remaining cards on top of your Deck in any order. If "Dark Magician" is Normal or Special Summoned to your field (except during the Damage Step): You can target 1 card your opponent controls; banish it. 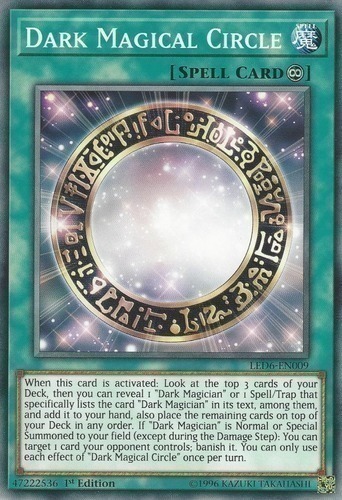 You can only use each effect of "Dark Magical Circle" once per turn.